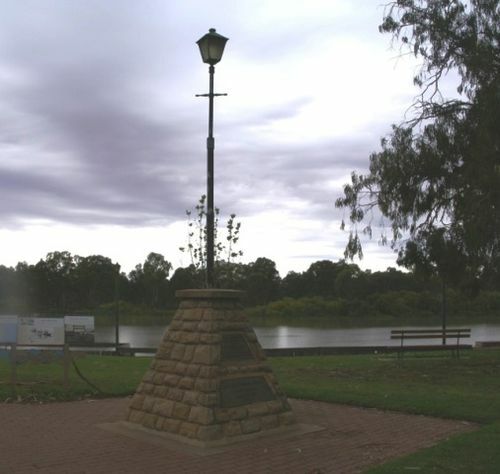 A monument commemorates the centenary of Captain Charles Sturt`s exploration of the Murray River in 1830. Additonal plaques were placed on the memorial in 1944 and 1979. The Sturt Centenary Expedition being conducted by the Royal Geographical Society in co-operation with the Historical Society of New South Wales and the Historical Memorials Committees of Victoria and South Australia, was at Renmark in the course of its journey down the Murray on Wednesday. Following the unveiling of the Captain Sturt memorial cairn there, others were unveiled at Loxton and Kingston punt on Thursday, and the party is proceeding to Morgan and Mannum on Friday, Milang and Pt. McLeay on Saturday, Hindmarsh Island on Sunday for similar ceremonies. The River bank above the Renmark wharf was crowded when the Minister of Public Works (Hon. M. Mcintosh), unveiled the cairn. Murray Pioneer and Australian River Record (Renmark, SA), 17 January 1930.